Bayern players celebrate a goal. 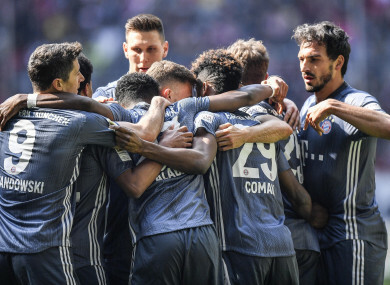 KINGSLEY COMAN PLAYED his way out of the dog house on Sunday, as his first-half brace helped fire Bayern Munich back to the top of the Bundesliga with a comfortable 4-1 win at Fortuna Duesseldorf. French winger Coman was involved in a training ground punch-up with team-mate Robert Lewandowski earlier in the week, but he made the headlines for the right reasons on Sunday, keeping Bayern on course for a seventh successive league title. If the opener was briefly and incorrectly credited to Mueller, there was no doubt about Coman’s second, a well-placed finish at the end of a delightful 41st minute move. Dodi Lukebakio gave Duesseldorf a late consolation goal from the penalty spot after a Mats Hummels handball, but Leon Goretzka slotted in Bayern’s fourth in injury time to put the cherry on the cake. Email “After training ground punch-up, Kingsley Coman makes headlines for the right reasons”. Feedback on “After training ground punch-up, Kingsley Coman makes headlines for the right reasons”.